Every day, Watch This offers staff recommendations inspired by a new movie coming out that week. This week: With the fall movie season upon us, we wave goodbye to the warmer months with some of our favorite films about the end of summer. Note: This originally ran in August 2015. Before he took off to a galaxy far, far away, never to return, George Lucas offered us one perfect, final summer night of youthful freedom before adulthood settled in. Inspired by Lucas’ own teenage years in Modesto, California, American Graffiti follows a band of spirited newcomers as they cruise the strip on the last night of summer, planning to leave for college the next day. In an early leading role, Richard Dreyfuss plays Curt, who’s still debating whether or not to leave his hometown to go to school. Ron Howard was aiming for a more adult role after wrapping up his time on The Andy Griffith Show four years earlier. Paul Le Mat’s John Milner will spend his whole life on the strip, while Terry The Toad (Charles Martin Smith) is just happy to get a set of wheels. To highlight the nostalgia effect, Lucas features not only an impressive collection of vintage cars, but a virtual vault of wonderful rock ’n’ roll songs from the era, which resulted in a best-selling double-album soundtrack. 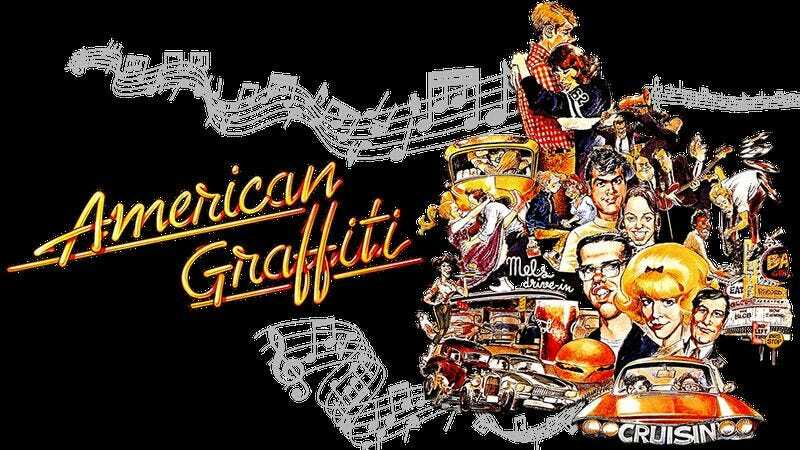 As the title indicates, American Graffiti is more an entertaining romp than a sentimental coming-of-age story: a microcosm of California teen life in 1962. Lucas’ intersecting storylines of the four friends take us through that final eventful evening: Steve quarrels with his girlfriend Laurie (Cindy Williams) on his planned last night in town. Milner is stuck driving 12-year-old Mackenzie Phillips around all night as he faces a challenge from dragster Harrison Ford. Terry is lucky enough to pick up Candy Clark, and Curt chases his Holy Grail of women, the legendary blonde in a white T-bird (Suzanne Somers). These plots are all highlighted in turns equally sweet (Steve and Laurie discussing the beginnings of their relationship on the dance floor), funny (Terry’s frequent wisecracks, as he deadpans after getting beaten up, “I’ll be dead soon, it’ll all be over”), and enlightening (the radio technician stuck with a freezer of melting popsicles turns out to be Wolfman Jack himself). None of it appears life-changing, but by the end of the movie, somehow all of it is, as fates are swapped and the dreamy curtain of summer drops to reveal the less-idyllic realities of adulthood. (The “where are they now” final card bleakly brings that message home.) But even though Howard’s Steve points out at the beginning of the movie, “You just can’t stay 17 forever,” watching the über-nostalgic American Graffiti can put you right back in that mindset, at least for a couple of hours. Availability: American Graffiti is available on DVD from Netflix, Amazon, or possibly your local video store/library. It can also be rented or purchased from the major digital services.